Paying attention to the quality of the air in your space can benefit everyone. From wanting to be comfortable in your own home or conscientious of your employees or customers in your place of business, noting and addressing indoor air pollution is essential. For people with allergies, asthma, or other breathing issues, the quality of the air you breathe has a direct impact on your overall health and well-being, so improving air quality and ensuring that the air in your space is clean and clear is essential. Read on to learn more about air pollution, how it impacts people with asthma and other breathing issues, common triggers and allergens, why indoor air quality is so important, what kind of help is available to you, and steps you can take to improve indoor air quality. For people who have asthma and other breathing problems, going into public spaces like malls, restaurants, casinos, movie theaters, and other indoor venues can be problematic. 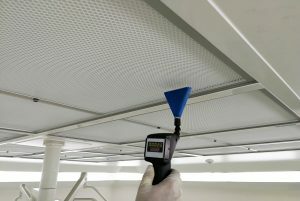 Many people think of environmental triggers like pollen and dust creating breathing problems in at-risk populations, but indoor triggers can be just as challenging and even dangerous. Smoke, perfumes, cleaning sprays, other fragrances, mold, mildew, dust, gas emissions, and many other triggers that don’t register as a problem for the average person can be a huge concern for someone with asthma. These particles in the air can irritate their lungs and airways or can create allergic reactions that affect the ability of the person to breathe. These allergens or irritants that go unnoticed by most can trigger both instant and gradual attacks in susceptible populations. Common symptoms include itchy or watery eyes, sneezing, sinus issues, scratchy throats, and other symptoms that mimic seasonal allergies or a common cold. Like outdoor air pollution, indoor air pollution is a major concern for people with breathing problems. In both homes and commercial spaces, identifying and treating indoor air pollution is an important part of safety management. Consider heavily fragrance areas or products, potential animal droppings or scents, mold or mildew, dust mites, spray disinfectants and cleaning products, incense, cigarette smoke, wood smoke, and other potential triggers when assessing your air quality. Homes, offices, and public spaces with safe, clean air don’t happen by accident. Proper ventilation, filtration systems to clean out bad air and bring in good air, and contaminant removal are all important parts of the process to address indoor air pollution. Ensuring that your ducts and ventilation systems are clean and functional will also help to address many indoor air pollution issues. Additional steps you can take include using high-efficiency air filters and changing them on schedule, avoiding the use of triggering products and known allergens, switching to an electric fireplace that doesn’t produce smoke, addressing water spills and other cleanup duties before mold and mildew can set in, staying on top of pest control management, and setting wearing a mask when dusting if you find that to be a trigger. For professional indoor air quality solutions in Norcross, GA, reach out to the experts at Air Quality Systems Incorporated today!